Perfect cycling conditions – clear blue skies and barely a breath of wind – for the 2018 Rising Sun Trophy race. The Limit group rolled off at 30 minutes. Mark O’Callaghan was slotted into this group as he returns to race fitness. He joined Graeme Parker – who won the 2017 edition of the Rising Sun Trophy – Terry Collie, Mal Rock and trial rider Marika Ley. Parker suffered two punctures early in the race and was out of contention. The others rode on, with O’Callaghan more than happy to ride well within himself and help the bunch. The 23 minute group included Jacqui Dawson and trial rider Kirsty Reid; Phil McLennan and the Lee brothers – Kevin and Brian. Mechanical issues cost this group as Reid and McLennan retired to the sidelines for mid-race repairs. They continued on, however their race was now a training ride. The Lee brothers were too strong for Dawson and were able to hitch a lift with the chasing 19 minute group as they swept by. The 19 minute group fielded a cracking lineup, many of which had never seen such a large number against their name. 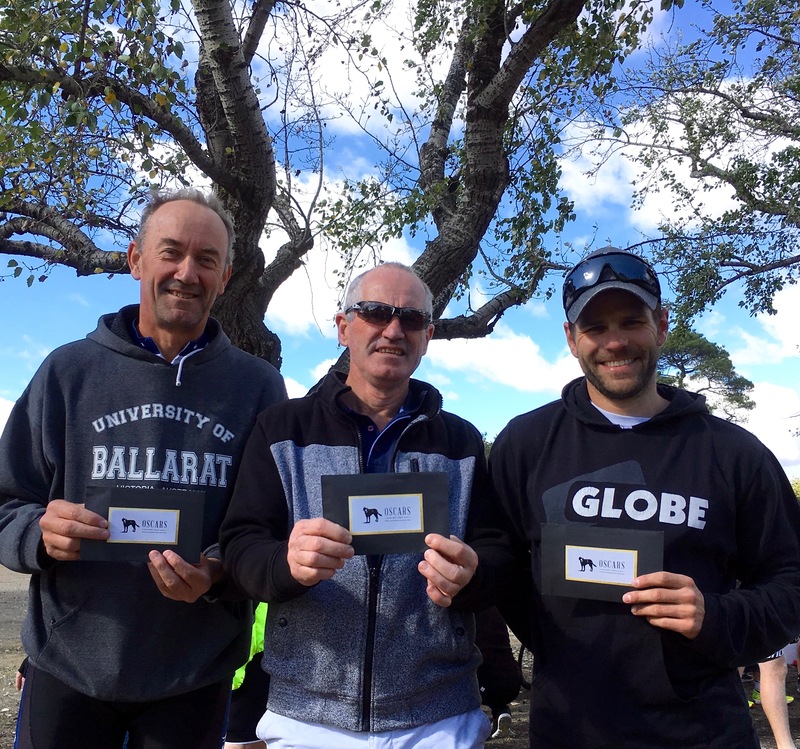 Led by James Gretton with able support from Danny Whelan, Peter Livitsanis, James Knipe, Bob Morley and regular Northern Cycling visitor – Noel Said – the group soon found their mojo and everyone contributed. Gretton used his massive engine to great effect as he drove the bunch at high speed on the fast sections, he owned those downwind sections. Little guys were hanging on as best they could, bigger guys were trying to help out without hindering Gretton’s efforts. They rounded up the 23 minute group (brothers Lee joining in the workload) and soon had the Limit riders in their sights. A long, long wait for the 5 minute group, who finally set off with controlled their start. Ash Burke had been promoted and the bunch were keen not to overextend him, or anyone else early. Powerhouse Matthew Ayres gradually ramped the pace up. Andrew Rushton, Rob Phillips, Bob Braszell and Dean Wells all played their parts. Wells suffered a flat on the third lap, however the group still held a 90 second advantage over Second Scratch. Second Scratch enjoyed a 90 second buffer over the Club Champion – Tim Canny – who was the sole rider off Scratch. Canny closed within 150 metres halfway through the race, however it was just a gap too far as the Second Scratch group rolled away from his grasp. Second Scratch was an interesting mix of riding styles – Stuart Brien, Rob Ellis, Matt Bowman, Brendan Schiemer and Greg Ley. Unfortunately they lost Matthew Bowman at the very start of the race when he suffered a mechanical. Bowman eventually got underway and joined Canny for half a lap, before easing out of the race and enjoying a training ride in the sun. The all powerful 19 minute group thundered through the final lap with the pace staying high. Gretton, Said, Knipe, Whelan and Morley shouldered the work as they raced towards the “Wall”. Victory was almost assured, nothing was coming from behind on this windless day to steal their glory! In true spirit, our man Gretton thrust himself forward. His muscles rippled, glistening with beads of perspiration as he surged upwards…then he slowed…then slumped as the wiley Whelan launched his own attack and quickly opened a gap. Said tried to follow and Morley who relishes hill climbs tacked onto the smaller rider’s wheel. Gretton, Knipe, Livitsanis and “Popeye” Lee are dropped, but this hill has a kick, can they rally? Down to the line and Whelan wins comfortably. Said is putting all the effort he can into the downhill sprint, but Morley packs too much punch a claims second by a length. Minutes later the 5 minute group reach the foot of the Wall with Second Scratch hot on their heels. Second Scratch know that they are racing for Fastest Time. At the base of the hill they are even, then the usual suspects exert their climbing authority as they pass the steep section and kick away. Ley is chasing Schiemer…who makes a gap and holds it to the line. Photo: Due rewards for the selfless Danny Whelan. 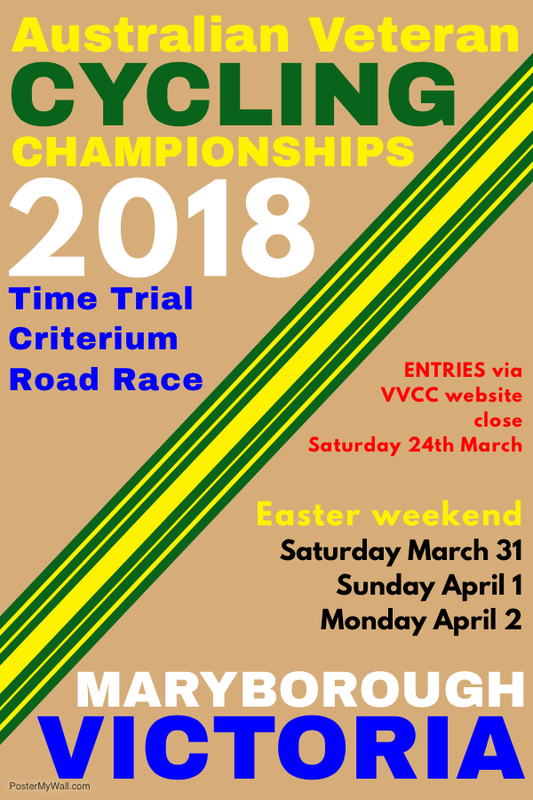 The 2018 Australian Veteran Cycling Championships were staged over the Easter long weekend in Maryborough, Victoria. 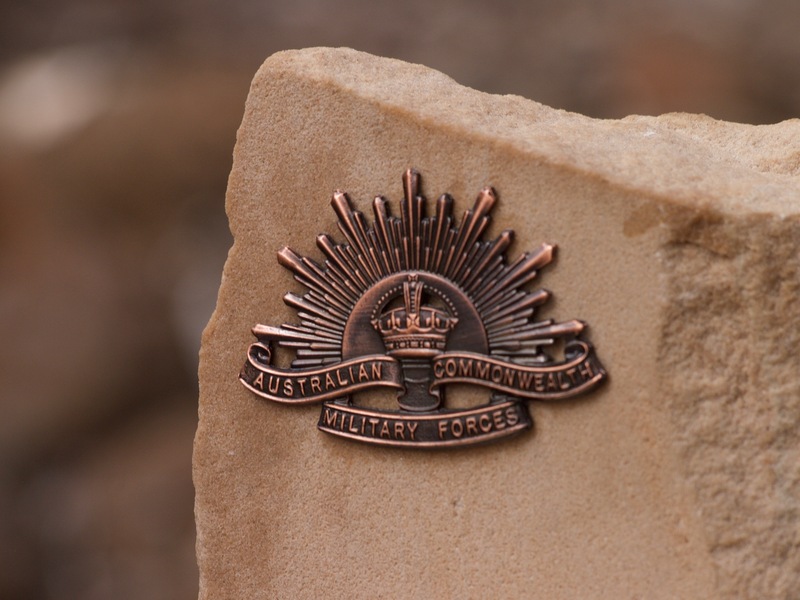 This report is written with a distinctly Team EUREKA slant, however we will recognise the significant efforts of other medal winners as well. As with most years, some events had low numbers and some events had reasonable numbers. 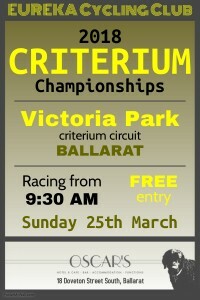 To combat low entries in criteriums and road race events, Age Groups are combined until at least six riders are formed. 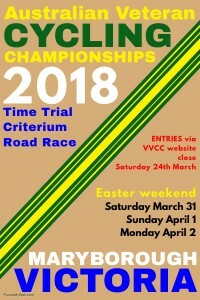 This can lead to interesting racing with up to four age groups contesting for four sets of medals in just the one race. The merits of the Age Group system will continue to be debated, but for now, this is the format and we can celebrate the accomplishments of the many who contested the events. Perfect conditions greeted the riders for the time trial. Sun, no wind and temperature in the low 20s. 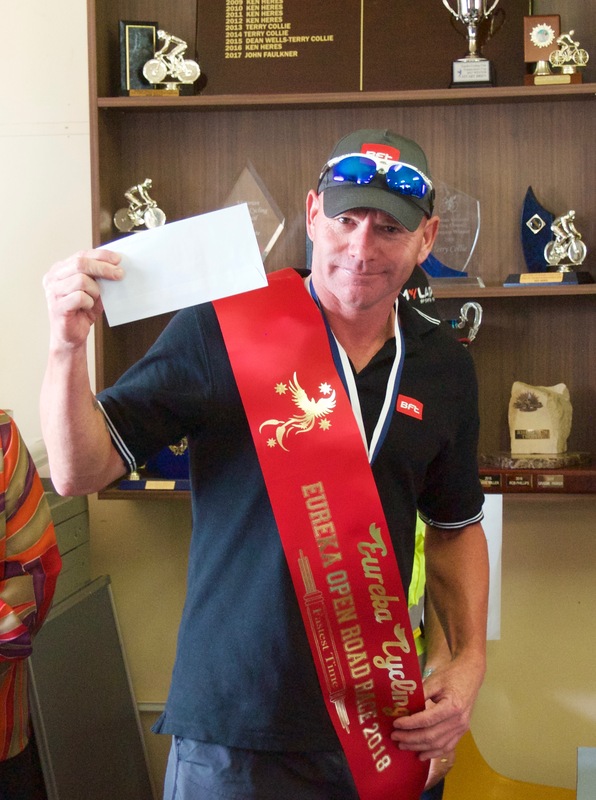 The first rider to compete at the Championships was Eureka’s very own Craig Lee (35-39 Male). Riders started at one minute intervals and it wasn’t long before Stephen Lane (Northern Cycling) was breathing down Lee’s neck. 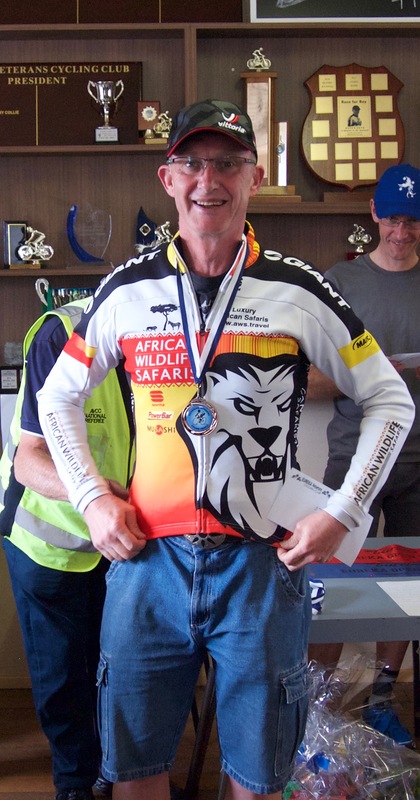 The third rider away was James Ogilvie (Eastern) who under the guidance of Lane recently rode the TRACK 1 hour and now holds the World Masters – record! 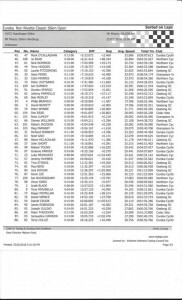 Ogilvie was just bike lengths away from Lane at the finish and now has an Australian Time Trial title to his name after averaging 48.352 Kph! Gretton competed in the 45-49 Male age group and Team EUREKA had four of the six riders entered. 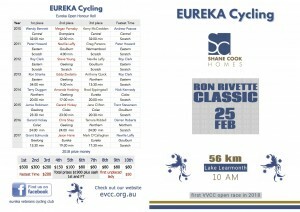 Jeremy Vanderklift, Peter Gunston and Matthew Bowman completed the Team EUREKA line up. Bowman won the SILVER medal for his efforts and finished just 25 seconds behind Justin Hogan (Eastern). 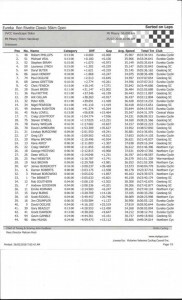 Bowman ranked 9th overall out of the 65 competitors (male and female) who contested the Time Trial. Gary Beazley and Stephen Biram both contested the 55-59 Male age group, but were no match for Southern Districts (South Australia) rider Michael Davies who recorded the fourth fastest Time Trial all day – behind Ogilvie and Lane (35-39 M) and Eastern’s Troy Drinan (40-44 M). 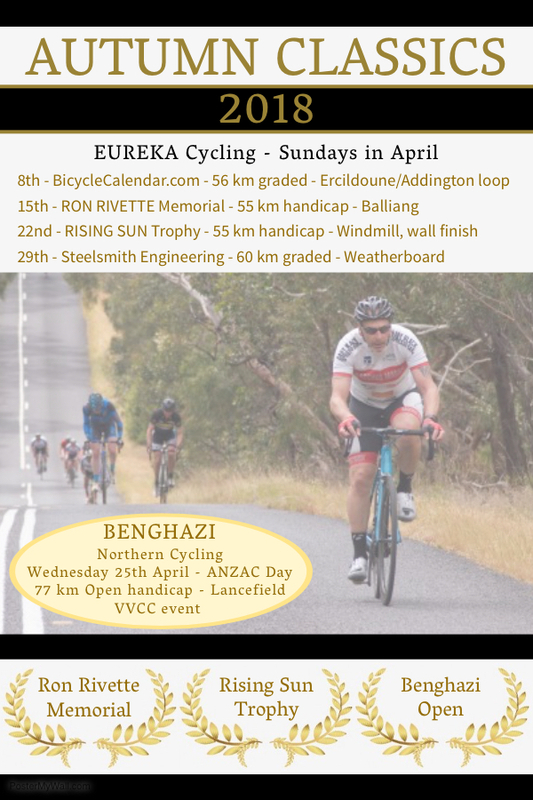 No EUREKA riders in the female events this year, however Emily May (ACT Vets) who is new to road cycling won the first of THREE (35-39 Female) gold medals for the weekend and ranked fourth fastest out the 17 female riders. The brilliant Anna Davis (Northern) won gold in the 50-54 Female age group and her 42.02 Kph ranked her 16th overall for the day!! Davis and Ogilvie each received a Mockridge Championship Jersey, trophies and prize money, on top of their Age Group awards. *There is video footage of Davis donning one jersey on her torso and the other upside down on her legs…such fun! Unfortunately the MyLaps timing system failed to upload to the website. AVCC officials had to photograph the results and post them on the net. Near perfect weather again, with cloud cover and only a light breeze. The temperature started in the mid teens and reached the mid 20s by the end of the day as the clouds drifted away. 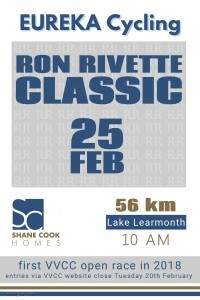 The first event of the day saw the combined 35-39 and 40-44 Male age groups race. Four scratchings reduced the field to just five riders and what could have been a great spectacle only ended up showcasing the issues with Age Group racing. Stephen Lane took off from the start and the field imploded within minutes. EUREKA’s Craig Lee united with Mathew Grealy (Central). Tim Bennet (Geelong) was somewhere up ahead chasing Lane and EUREKA’s Duncan Bates was somewhere out the back. To add to frustration, the MyLaps system registered ridiculous times for the first lap and raised further questions about the current software version. The 45-49 Male event fielded the complete podium from 2017 and the race was on from the start. 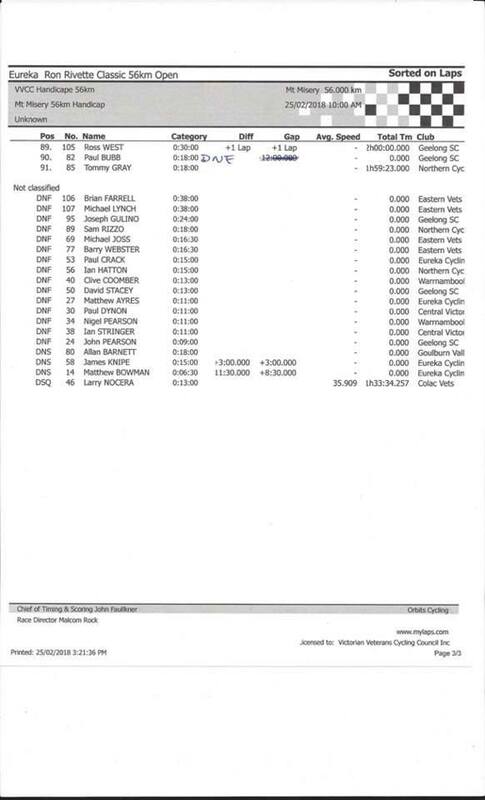 Team EUREKA fielded four of the 10 riders. 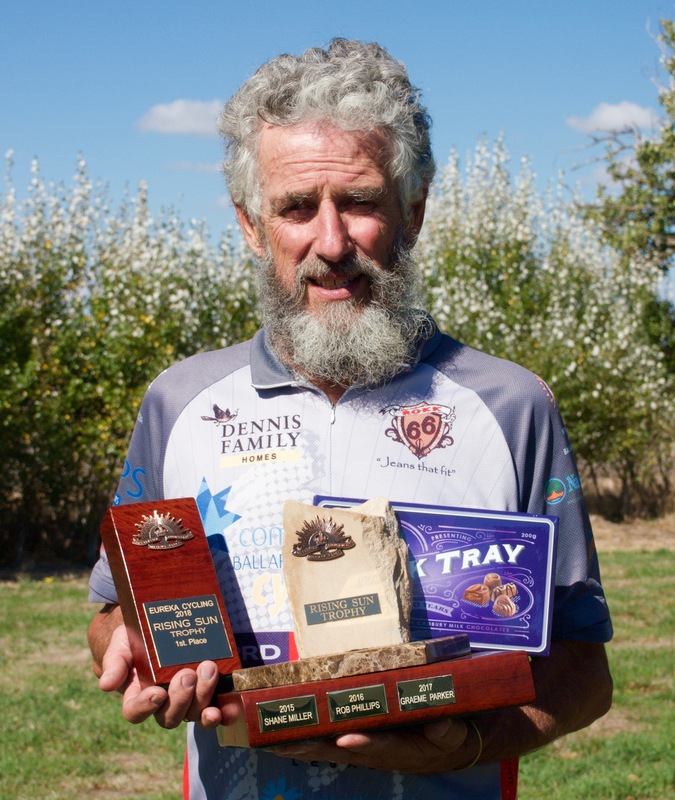 Craig Feely (Southern Districts, S.A.) won the event in 2017 and exploded from the start with Eureka’s Dean Wells leading the chase pack. James Gretton took over the pacemaking once Feely was caught and time trialled on the front for a lap. The pace was high and Geelong and Surf Coast rider Kane Airey was one of the early antagonists. Gary Smith (also Southern Districts) reacted to many of the early attacks, while Scott Riddell (Northern) and Alex Randall (Eastern) helped keep the pace strong. The high pace and constant attacks was too much for Gretton who eased out after 12 minutes, having sacrificed his Easter Sunday for Team EUREKA. Mid race and Randall broke away from the pack. Airey and Riddell waited half a lap then crossed to the leader. Airey dropped back to the chasing pack after a few laps. Eureka’s Peter Gunston gave a few efforts on the front chasing, before he too exited the race. Matt Bowman put in some long efforts on the front which had everyone scrambling for wheels, but the two leaders were strong and had extended their lead to 30 seconds. Nearing the end of the race and the chase bunch was being tactical with some riders just happy to race for the bronze medal. The leaders had slowed, however the surging in the chase bunch meant they were always just around the corner. Bowman started putting in some longer efforts which saw the chase group lose more riders. Try as he might, Bowman could not get much help from the others in the bunch. With half a lap remaining he buried himself and all of a sudden the leaders were within 200 metres. Randall knew Riddell was strong in the sprint, so the two had started playing cat and mouse. The chasers closed but Riddell blasted away to the gold medal long before contact was ever made. Randall hanging on for a worthy silver and a four way sprint saw Smith take the bronze. The next Team EUREKA riders out on course were Stephen Biram, Tony Mirabella and James Knipe in the 55-59 Male event. Biram had a bad day and turned it into a training ride. Mirabella and Knipe had a battle royale with the Knipe Rider taking bragging rights over the Italian Stallion. Lindsay Burgoyne WON gold in his race, which was a combined 60-64 and 65-69 Male event. Burgoyne was often on the front of the pack leading the chase on the two riders who weren’t even in his event. 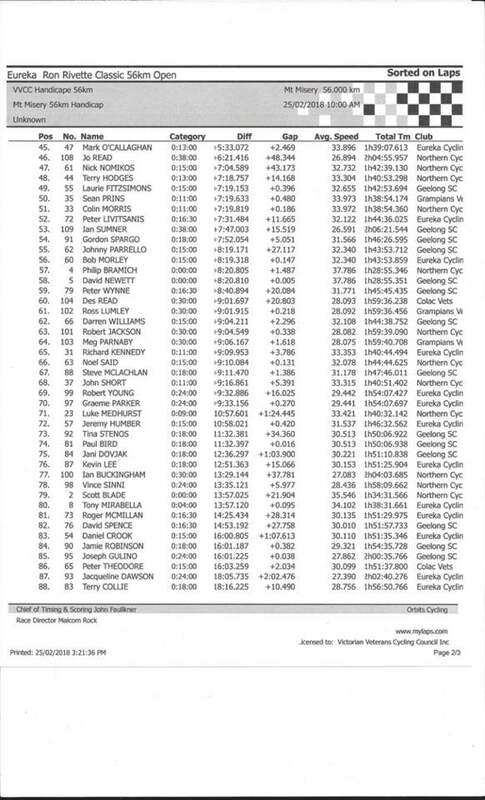 A big sprint finish saw Lindsay finish fourth in the combined race, yet easily earn his Australian Champion title! Team EUREKA had two more riders compete on the day. 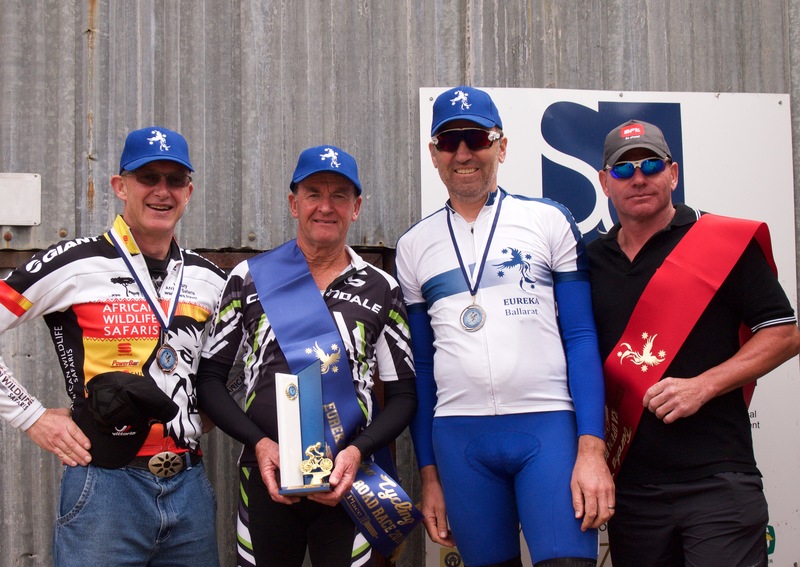 Terry Collie and Robert Braszell raced in the 70-74 Male event which fielded nine riders and they averaged over 38 Kph for the race! Collie bided his time throughout, whilst Braszell was either setting the pace or leading the chase pack. A close finish saw Braszell just miss the win by 0.183 seconds, but earn a worthy silver. For the Female events, nine age groups were combined into three separate races for what can only be described as a timekeeper and referees nightmare. Sunny weather and a strong southerly, with temperature in the low 20s. Four different distances were designated to the various age groups and sexes, with each race starting at the top of a hill with a tailwind and concluding in the same place after a steady climb back into the wind. Fun times! Team EUREKA’s first riders away were Terry Collie and Bob Braszell in the 70-74 Male race over 50 kilometres. Eleven riders contested the event and like the previous day, Collie bided his time in the field whilst Braszell made sure the race was hard for everyone. The climb back to the finish saw the field split, however five riders sprinted for the medals with just two seconds separating them on the line. 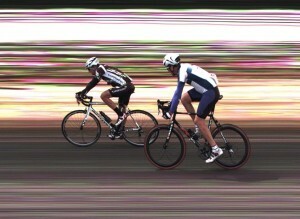 Braszell came within millimetres of winning and the photo finish camera was required to declare the results. The difference in the end was just 0.009 seconds! The next Team EUREKA rider to roll out was Belinda Burgoyne in the combined 30-34, 35-39 and 40-44 Female event over 50 kilometres. Burgoyne collected bronze in her event! The 35-39 and 40-44 Male combined event saw Stephen Lane say ‘hi’ and ‘bye’ before dashing off on a solo 85 kilometre race…as you do. Team EUREKA’s Sam Smith probably wondered what the blazes had just happened before deciding he may as well race the other guys. Smith came to the finish with Tim Bennett (Geelong) and Richard Abel (Eastern) before sitting up to let the two older riders race for gold in their event – Abel taking the win. David Ogilvie and Duncan Bates were the other two EUREKA riders in the combined field and both endured hellish days. Three races over 68 kilometres were the final events staged on the day. Team EUREKA had representatives in each event and they all faced well seasoned opposition. The 55-59 Male event saw Team EUREKA’s chances headed by Tony Mirabella, with Gary Beazley, Stephen Biram and James Knipe in supporting roles. Another Southern Districts (S.A.) in Michael Davies, joined with Northern’s Philip Bramich to make the race their own. They streeted the field by minutes. Mirabella was in the group of five racing for bronze. The final Team EUREKA rider to race at the carnival was Peter Kiel in the 60-64 Male event. Kiel acquitted himself well and got into the winning breakaway with ACT rider Owain Tilley and Northern’s Kevin Russell and Trevor Coulter. Heartbreakingly, Kiel missed a medal by just 0.015 seconds as the quartet raced across the line. 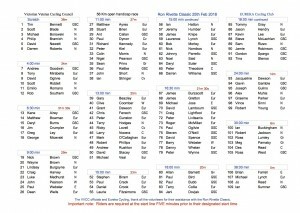 With a staggering 23 entries, the feature race on the day was the 45-49 Male event. Fielding the likes of Darren Roberts and Tony Giuliano (Northern), David Newett (Geelong), Hudson Crothers (Central), Craig Feely and Gary Smith (Southern Districts, S.A.), the stage was set for an epic duel…and so it was! 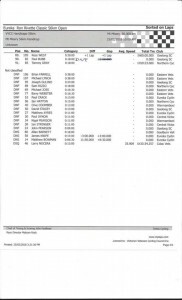 Team EUREKA’s Matt Bowman did not start, however six other riders did including new member Tavis Baker, Jason Birch, Robert Ellis, Greg Ley, Michael Veal and Dean Wells. Baker was a “bit flat” after doing a 24 hour ride around Lake Wendouree from 6 PM Thursday to 6 PM Friday. That 108 lap effort (645 km) was equally matched by his feat in raising over $10,000 for the Royal Children’s Hospital. It was only natural that Baker would be up the front driving the pace as the peloton roared along with the tail wind early in the race. 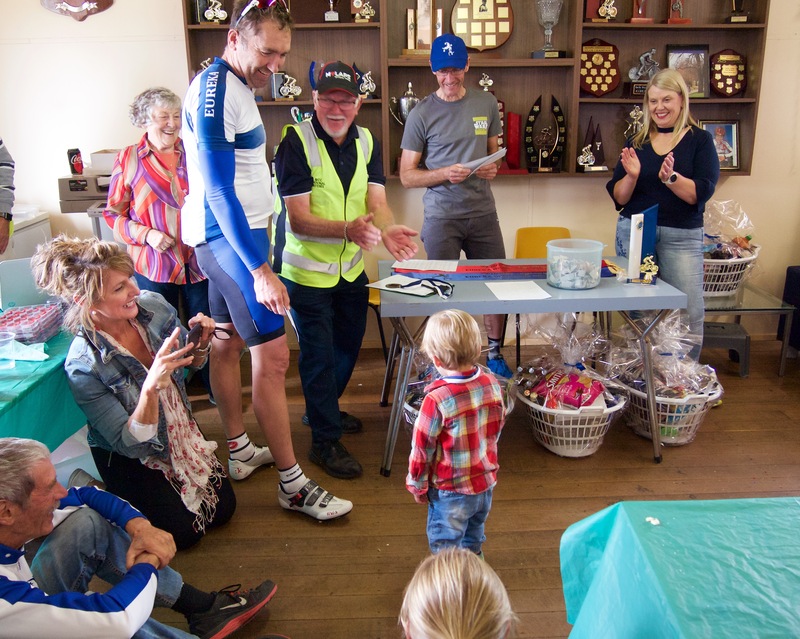 Three different Northern riders rode off the front during the first leg out towards Dunolly – curiously, other Northern riders led the chase each time. Most of Team EUREKA sat back in the pack watching these events unfold without exerting much effort, of course Baker was always up near the front. Giuliano survived his stint off the front through the turn near Dunolly. Now the race headed straight back into the wind and also onto the hills. Wells rolled up to the front of the peloton and closed the gap to Giuliano. He was joined by Veal and they started rolling turns. Ellis was the next EUREKA rider on the front as everyone waited for the inevitable attacks. Giuliano tried again and was left to dangle for a while. Fellow Northern rider – Darren Roberts – then started to ramp the pace up, all the while being followed closely by South Australian Gary Smith. The pair tried multiple surges on the hills, however nothing stuck. Wells and Ley chased down the mini attacks and Baker resumed taking turns on the front. The next turn saw the field head downhill and Geelong’s Kane Airey led the field at speed through a corner cambered so steeply it looked like a velodrome. Up ahead the road narrowed and turned again, opening the peloton to a fierce crosswind. Roberts and Smith continued their games, now surging and crossing from one side of the narrow road to another at speeds over 40 Kph. Wells and Baker were both close to the front when one dive to the left pushed Wells off the road and Baker followed. The peloton had split and the race had ignited. Baker waited for Wells and they started to chase the second group on the road. Northern’s Roberts, Riddell and Giuliano, David Newett (Geelong), Hudson Crothers (Central), Alex Randall (Eastern), Smith (Southern Districts, S.A.) and another two riders were in the first group and had quickly opened a hundred metre gap. Ellis, Birch and Ley were doing their bit to drive the chase bunch of about nine riders. On a narrow road, with a strong crosswind and riders stretched to their limit, a trailing referee vehicle passed all the chasing riders, even though the gap to the leaders was less than 200 metres. Hot on the official car’s tail was a medical van, which could not get past the second group and actually towed Baker and Wells along with it. The driver of the medical vehicle even sounded the horn to alert riders to its presence. Try as they might, the Baker and Wells could not get the driver’s attention and so they were stuck just twenty metres behind the bunch they were trying to catch. Eventually they risked a small gap on the left side of the vehicle, caught the bunch ahead and joined in the chase. The sudden increase in pace as Wells and Baker shot through unfortunately resulted in Ellis being lost to the bunch…he too would ride to the finish alone. The chase continued and picked up a rider who had been dropped from the lead bunch. A left turn had the race back on the original road from Maryborough to Dunolly and the chase bunch picked up Randall who had also dropped from the leading group. With a tailwind the gap stayed about 300 metres wide. One rider rallied the chase bunch and had almost everyone rotating through track turns. The gap to the leaders still remained the same as the race worked its way back to the Dunolly turn. Back into the headwind and the gap started reducing. Up the hills the race continued and riders were gasping for breath everywhere. The gap continued to narrow as the highest peak was passed, then the second vehicle incident occurred in the leading bunch when Newett clipped wheels, crashed and had his bike allegedly run over by an official vehicle. Crothers eased out of the lead bunch to attend Newett, however other vehicles had arrived by this time and Crothers joined in with the chase bunch. The gap eventually narrowed, then a few of the chasers who had been “sitting on”, took turns at trying to cross the final gap in the headwind. This both broke up the group’s rhythm and put some riders to their absolute limit. The catch was made just hundreds of metres before the turn back towards the crosswinds. The pace ramped up again and the field of sixteen stretched out before the pace was slackened and the race compressed again. The third vehicle incident came in the form of a car racing towards the peloton as it neared the turn onto the narrow crosswind road. Calls went out and the leaders surged as the race went into single file. The vehicle pulled up (still partially on the very narrow road) and the driver jumped out with his telephoto lens camera and started taking snaps…mind boggling! The race was stretched out and on in earnest. Wells, Airey and Ley were early casualties in the crosswind. Three riders – Roberts, Smith and Giuliano – had opened a gap with about 15 kilometres remaining. The chase was blowing apart as riders went into survival mode…and the gap grew. The final turn back into the headwind meant a 6 kilometre climb to the finish. The odds were with the chasers but only Baker and one other faced the breeze. The gap grew. To the finish and Giuliano didn’t try to match Smith and Roberts as they sprinted for the line. Roberts winning gold by a few bike lengths. One minute later the peloton appeared. Baker eased aside as the sprint started and Birch sprinted clear to claim fourth place and provide some reward for Team EUREKA’s efforts. Well that is the wrap. 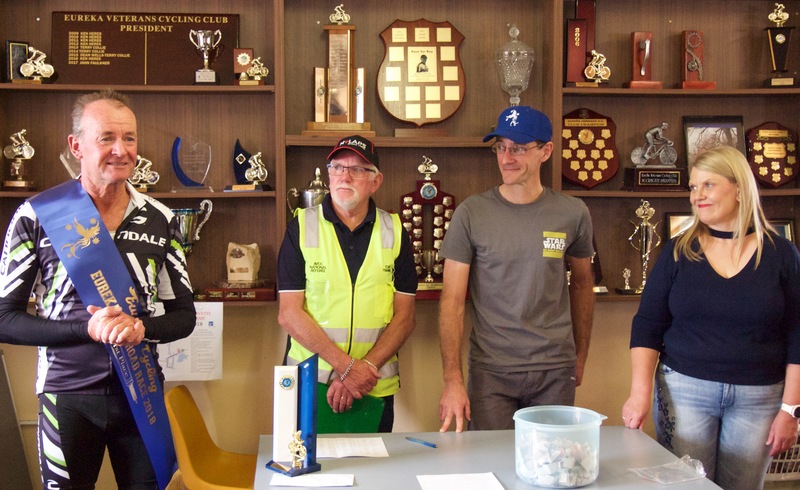 It was a long weekend and Team EUREKA should be proud, not only of the efforts of our riders, but also for the efforts of our members who volunteered to perform corner marshal duties or acted in an official capacity. Thank you Marika, Darwin and Paddy. Huge applause for Lois, Bill and Terry. A standing ovation for Eureka President John Faulkner who battled with the timing system all weekend. Five riders enjoyed close racing until the call for two laps. The race split when the diminutive Belinda Burgoyne put me in a surge. 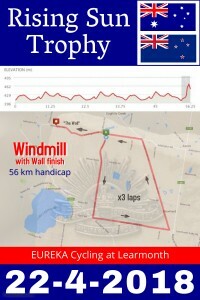 Mal Rock and Rob Young slipped off the pace, but John Creek scrambled for Burgoyne’s wheel and Phil McLennan followed. Bell lap and Burgoyne led them through – Creek and McLennan taking what little sit was available. No change in order down the back straight before sweeping into the head wind for the final time. Creek hooked out and quickly put paid to his counterparts, McLennan second and the courageous Burgoyne taking the final podium place. All riders completed the event. Seven riders rolled up to the start line after Peter Livitsanis suffered a flat tyre during his warm up. The wind had certainly picked up by this stage and the tailwind down the back straight was begging for fast riding. Ralph Jones (James Gretton) stretched the race out each time they went through the hairpin bend. Eventually he rode off the front in a premeditated plan. His power output was so awesome and his style so perfect that he was in complete control of the race until he wanted it to regroup just four laps from the finish. Bob Morley worked his way through the field asking if anyone knew who Tim Tyler was – everyone was wary of this unknown rider! Two laps to go and Mark O’Callaghan went on the front, Gretton second wheel, James Knipe third wheel and Jeremy Humber close behind, with Brian Ure and Roger McMillan both keeping out of trouble and staying well positioned. O’Callaghan lifted the pace then peeled off with 700 metres remaining, Gretton took up the running and powered through the second last bend and into the head wind. Final bend and Knipe sweeps through and explodes away. Humber came out of the pack, but couldn’t close the gap. Roger McMillan nabbing third after weaving his way through the pack. Come one, come all. Challenge yourself! Unfortunately the race was robbed of one competitor before the riders even lined up, with Tony Mirabella suffering multiple punctures. Jason Birch was eyeing off a higher podium position in the 2018 rendition of the race; Dean Wells was aiming at not being dropped; Paul Pickersgill was hoping to be the surprise packet and Peter Gunston was eyeing off a special birthday present for himself. Lindsay Burgoyne, Stuart Brien, Dave Olgivie and Mick Veal (2017 Div 2 Champ) were excited just to race, after missing out the previous day (Open race at Newham cancelled). 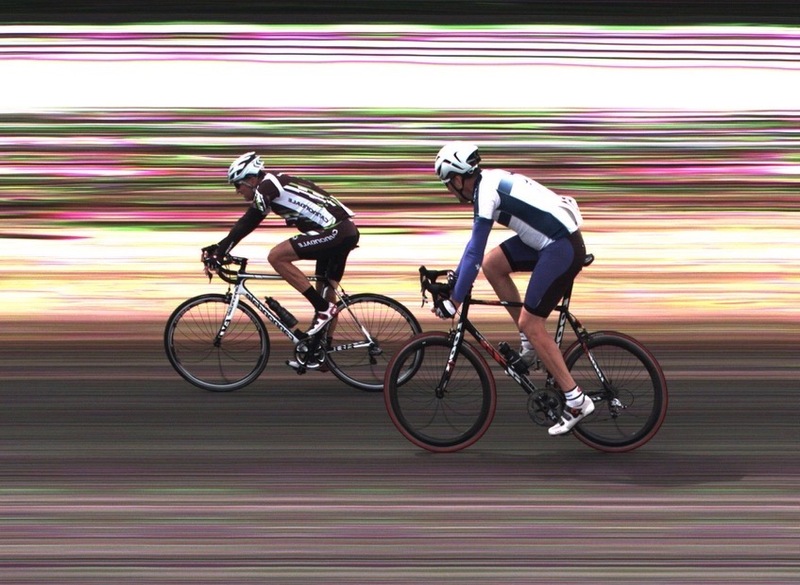 The race started off slowly – with a gentleman’s agreement to get the feel for the damp road and gusty wind. 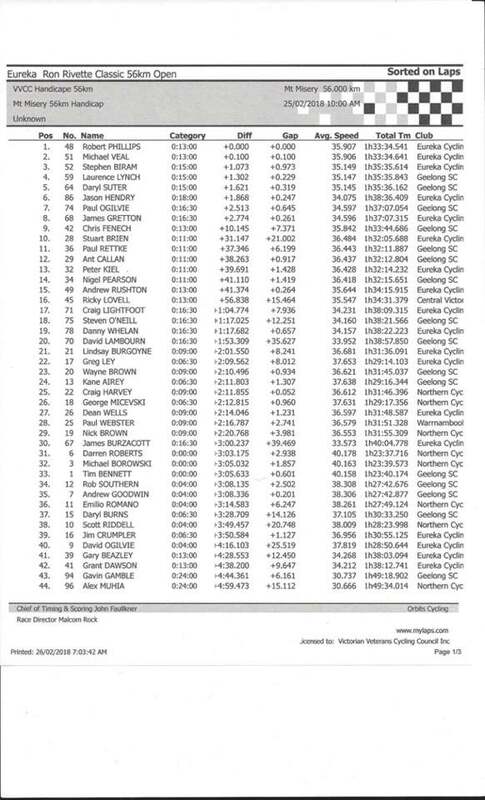 A few riders tried early breakaways, with Mick Veal going solo for three or four laps. Other “attacks were short lived by various riders in an attempt to draw someone else out to play. Jason Birch launched the first major attack of the day which actually stuck – or was “allowed” to stick. The others quickly eased off and left Birch out front for five or six laps before eventually regrouping. The remainder of the race played out in a similar vein. Anyone excited enough to roll off the front, quickly found themselves isolated in the wind. Then the pace would back off as soon as the field regrouped. Birch tried to stretch the field mid-race. Ogilvie joined him, however the bunch rallied quickly and shut it down. At some stage during this passage, Veal pulled aside with a “flat” tyre, much to the disappointment of son Toby who looked up to Jude and was heard to say ‘You never stop riding Mummy’. Veal performed a ridiculously fast “repair” and rejoined the race after his rest…only to pull out a lap or so latter with another “mechanical”. With less than 5 minutes remaining Ogilvie tried again down the right side in the home straight, Wells also attacked on the left side. This split the field and the pair quickly formed up to press the advantage, however it was short lived as a Brien, Birch and Burgoyne shut it down. Ogilvie launched down the right and Birch went with him. Pickersgill was soon overtaken and Wells was giving chase. Ogilvie’s attack had lined the field out as they swept through the second last bend and into the head wind. Birch tried to hang onto the wheel and Wells led the rest. Ogilvie eased with 400 metres to go and the group rejoined with hearts pounding and riders gulping for air. Final bend and Lee emerges for the first time and plays his one card – SNAP! His attack is so swift some riders don’t even try to rally. Brien follows and Gunston and Wells also came out of the pack. Lee streaked away to claim his second Club Criterium Champion title in just four months. 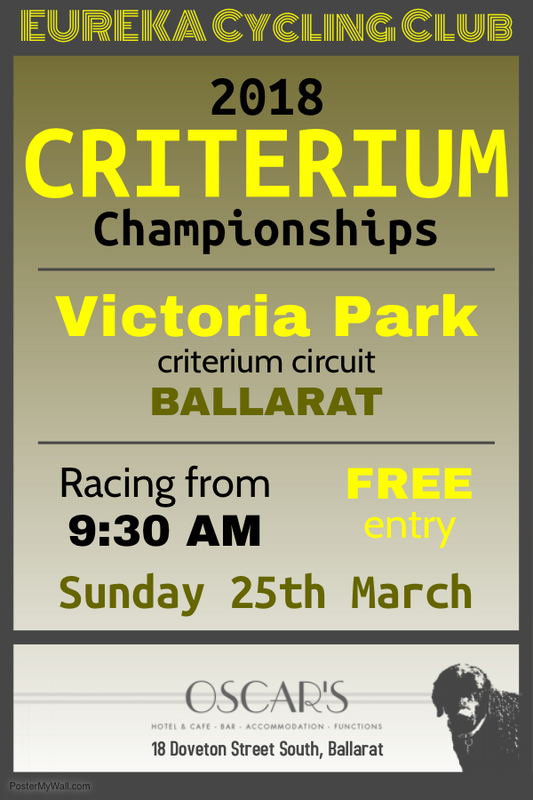 The winner of each race received a voucher from the criterium series sponsor, before heading down to the CBD and enjoyed coffee at Oscar’s Hotel and Cafe Bar. Championship medals will be awarded during April at the club rooms at Lake Learmonth. Strong winds greeted the 107 riders who converged on Lake Learmonth for the first VVCC Open race of 2018. The wind and thick cloud cover kept the “feels like” temperature hovering around a cool 6 degrees – perfect for the local riders! Out on the road the wind devastated many groups with riders dropped from each bunch and strewn around the course. Sixteen riders pulled out of the event and possibly 50 riders wished they had done so before venturing so far. The dominant force today was the south easterly wind which hovered in the mid 40s and gusted up to 60 kilometres and hour. Limit set off at 38 minutes and quickly disintegrated. The 30 minute group blew apart inside the first 20 kilometres. The 24 minute group faired no better and split into ones and twos. 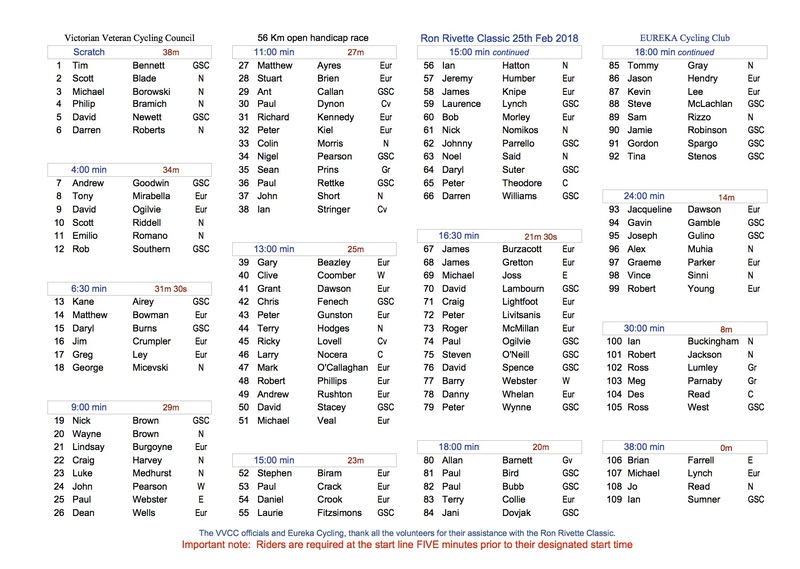 The 18 minute group lost a few riders on the climb out of Addington with the rest being picked up by the following bunches. As with the front groups, the wind played havoc with the 16:30 minute group. They also had a rider who had inadvertently started with them. That rider was subsequently disqualified from the race, however not before inflicting almost as much havoc on the group as the wind. The 15 minute group was disassembled in the first third of the race and never really recovered. The 13 minute group was all conquering today and took home the race quinella. This power bunch was filled with quite a few large riders who revelled in the tough windy conditions and swept all before them, literally. They started strong and many of the big units kept the bunch powering along. Their number dwindled, but they held off the chasing pack. On paper the 11 minute group looked to have a good chance of rolling up the bunches ahead. They started like rockets, however not enough riders were sharing the workload and they only chipped away at the time difference. The 9 minute group struggled from the start and completely imploded with 50 kilometres remaining. The remnants of the group joined in with the next bunch. The 6:30 minute group gelled and worked together well. They collected the odd vanquished rider and kept their work rate high. Second Scratch started at 4 minutes and smashed each other. A race within a race, some waited for Scratch – well what was left of Scratch – and others raced ahead. Scratch blew apart early and three riders chased hard. They easily recorded the fastest times on the day. Uniting with dropped Second Scratch riders worked in their favour and they eventually collected even more Second Scratch riders. 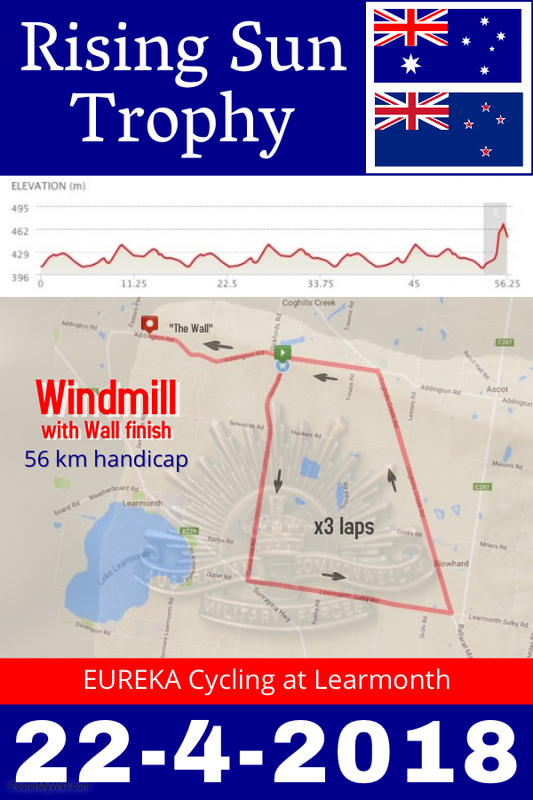 The lap of Weatherboard gave each group an opportunity to experience a strong headwind early and it certainly set the script for how the day would play out. Those outmarker bunches were smashed and never recovered. The 13 minute group was on the verge of self destructing with a very keen rider from the 15 minute group (missed his start) leading the way. Rob Phillips (Eureka Cycling) soon put everything back in order and set the tone for the rest of their day – work smart and work hard. 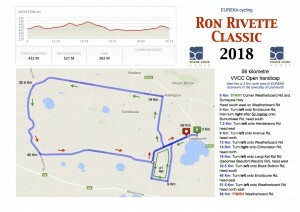 With powerful riders such as Chris Fenech (GSCC), Grant Dawson (Eureka), Ricky Lovell (Central Victorian Vets), Andrew Rushton (Eureka) and Michael Veal (Eureka) in the bunch, the group always promised to be a threat. The 11 minute bunch were not working anywhere near as well and found only four or five riders rotating turns. They also started shelling riders and even though the 13 minute bunch was within reach, the chase was looking grim. Not as grim as the 9 minute group who had few contributors before the Eureka pair of Lindsay Burgoyne and Dean Wells dropped their bunch on the run to Addington. Too far ahead to ease up, the pair found themselves in no man’s land and quickly passing dropped riders from the groups ahead. The race ahead saw the 13 minute group had set their sights on the 15:00 group and sweep them aside without much ado. Hungry for more, they licked their lips as closed in on the 16:30 group and caught them at the 30 kilometre mark. With at least seven riders contributing solidly, the 13 minute group powered on strong enough to hold the chasing 11 minute group whose rotations were not improving. Too much work being done by too few. They almost bridged the gap to the 13 minute group as they turned onto Black Bottom Road. Finally the group started rotating better, unfortunately the pace dropped too much. The 13 minute group was so close…but it was a bridge too far. They started collecting riders dropped from other groups, some stuck on, some were dispatched quickly. Turning off Black Bottom Road and it was time for the 13 minute group to push even harder if that was possible. The call for middle of the road went out and the peloton squeezed left and made room for just seven bikes. From that point on riders were shelled every few kilometres. The survivors of the 18 minute group were just ahead and within a few kilometres they too had been rolled up. They still had passengers from the 15 and 16:30 minute groups in their mix – this doesn’t include Stephen Biram (Eureka) who had missed his start with the 15 minute group, but had contributed solidly throughout. Paul Ogilivie (GSCC) was also a big contributor to this large bunch mainly consisting of Eureka riders. They had the race lead at this point and the 11 minute group were still close, but unable to close those few hundred metres. The 11 minute group was now collecting riders who had been shelled from the raging 13 minute bunch, however the bunch ahead was maintaining a gap. The 9 minute duo of Burgoyne and Wells weren’t making any ground on the 11 minute group and unbeknownst to them, the 6:30 minute group was closing fast having collected a few other 9 minute riders. The race lead turned left and up the final climb towards Weatherboard. With the strong tailwind they didn’t lose any time to the chasers. Phillips led the pack and they pushed hard. Veal surged and the Geelong & Surf Coast riders Laurence Lynch and Daryl Suter from the 15:00 minute group marked him. 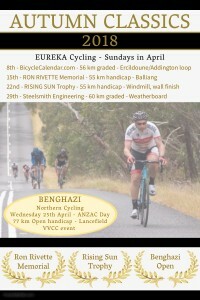 Eureka rider James Gretton (16:30) bullocked his way to the top with another 13 minute rider – Chris Fenech (GSCC). Ogilvie (GSCC) was ever watchful, could he be the Ace in the pack? The string was stretching, so close, yet so far…and the call was just 20 seconds to the lone chaser. They crested the hill with two kilometres remaining and they kept driving and driving. Brien had made some inroads on the climb, but his group had somehow scrambled back to his wheel. A short breather and then Brien went again and this time he broke free of the bunch. Ahead and the unlikely fellowship of 13, 15, 16:30 and 18 minute riders was about to become unfriendly. Into the gutter they went, words were exchanged, it got messy. The sole 18 minute rider in the bunch – Jason Hendry (Eureka) – launched early at the dip. Daring, adventurous and ultimately doomed to fail, Hendry set up the perfect lead out for the other riders. Veal had Hendry’s wheel, with Phillips just behind and Biram preparing to pounce. The race got messier – riders jockeyed for position. One rider zoomed away (subsequently disqualified). The others started their sprints and the spectators didn’t know where to look. Veal hit the front and Phillips shot over the top in the final metres. A home win! 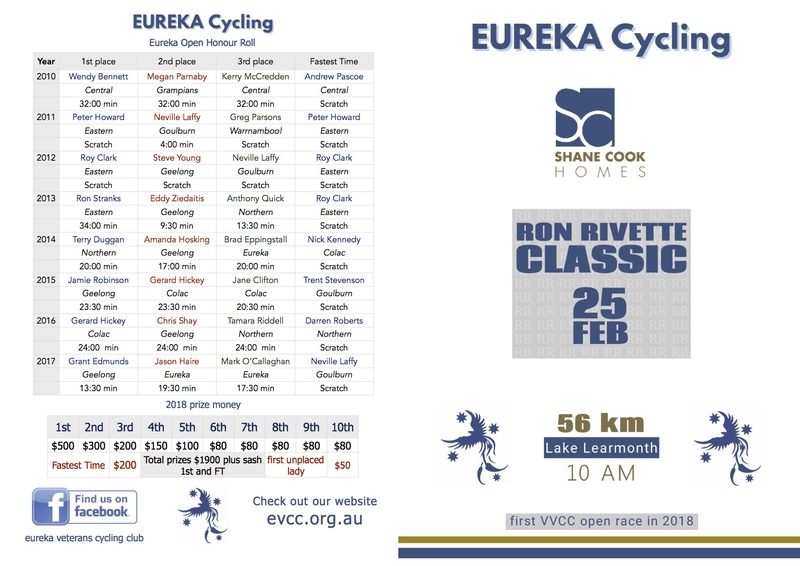 EUREKA Cycling thank the VVCC referees and time keeper for officiating. which our members donated to the club. 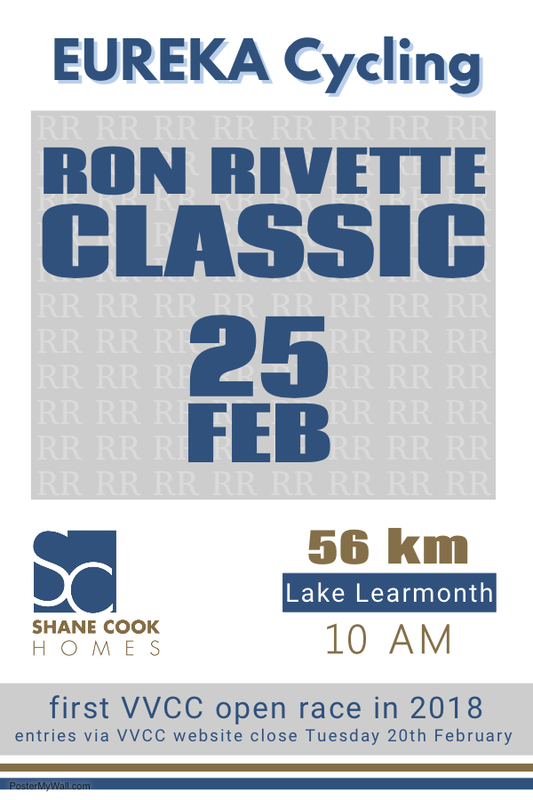 by the sponsor of the Ron Rivette Classic – Shane Cook Homes. Congratulations to all the riders who tackled the 2018 Eureka Open. Everyone should be proud of their efforts in such trying conditions.